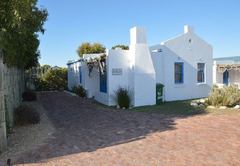 Long Beach Cabanas is a property providing self catering in Langebaan for tourists visiting the Cape West Coast region. 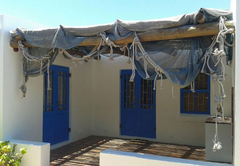 Situated just 50m from the beach, the Long Beach Cabanas offers self catering accommodation in Langebaan. Built in the rustic West Coast style, the cabanas are suited for families and the casual traveler looking for comfortable and casual accommodation in Cape Town. There are three cabanas, namely Shekina, Shalom and Shilo. 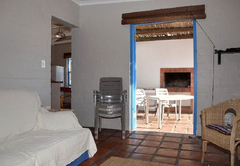 Each cabana has a kitchen, lounge and dining area, as well as a private outside braai area. 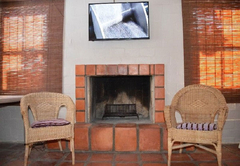 Linen and bath towels are provided and each cabana has a TV with selected DStv channels and free Wi-Fi. 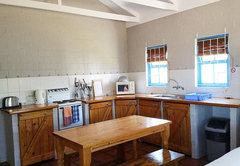 Shekina can accommodate up to six guests and comprises of three bedrooms, two bathrooms, a kitchen and dining area and a separate lounge with a fireplace and a TV. The first bedroom has a double bed and the second and third bedrooms each have two single beds. Shalom comprises two bedrooms and one bathroom. 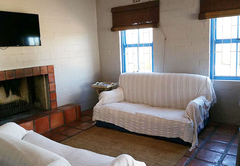 There is an open plan kitchen, dining and lounge area with a fireplace and a TV. 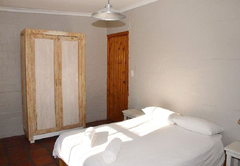 The first bedroom has a double bed and the second bedroom is furnished with twin beds. These two rooms share a bathroom with a shower. Shilo has two bedrooms and one bathroom. 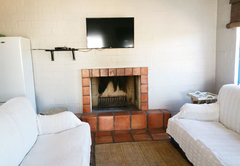 There is an open plan kitchen, dining and lounge area with a fireplace and a TV. 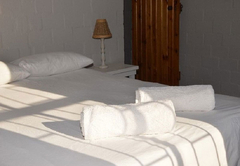 The first bedroom has a double bed and the second bedroom is furnished with twin beds. The bathroom has a shower. Shekina can accommodate up to 6 guests and comprises 3 bedrooms, 2 bathrooms, a kitchen and dining area, and a separate lounge with an inside fireplace and a TV. The first bedroom contains a double bed and the second and third bedroom has 2 single beds. Shalom comprises 2 bedrooms, 1 bathroom, and an open-plan kitchen, dining and lounge area with an inside fireplace and a TV. The first bedroom contains a double bed, and the second bedroom contains twin beds. These 2 rooms share a bathroom with a shower. Response timeLong Beach Cabanas typically responds to requests in 5-10 minutes.